Download as Apple Dashboard Widget. Your webcams and your settings are currently stored in a local cookie. You can only access them on this computer and this browser. (You will need a Google Account. Read More...) Your webcams will be stored on Googles server farm. It uses Googles login mechanism to identify yourself. This way WorldWatchr doesn't get hold of your Google account password! Hint: When you store the webcams on the server you can manage them from your desktop computer. Your webcams and your settings are currently stored on our server. You can access them from everywhere. Now you can stay in touch with your home, famous places of the world, the current traffic conditions and much more by watching your favorite web cameras. 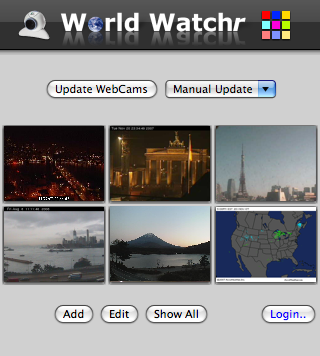 This WorldWatchr application makes it easy to monitor web images which are continuously updated (like web cam pictures). 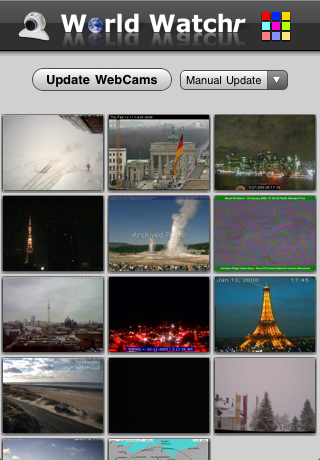 It can cycle through all your cams and updates the images periodically. The images don't have to be produced by web cams. 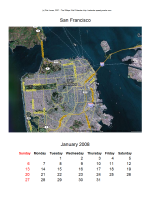 You can monitor any image which is updated over time like weather radars, traffic maps and so on. The webcams and settings are stored as a cookie in the browser on your local computer. 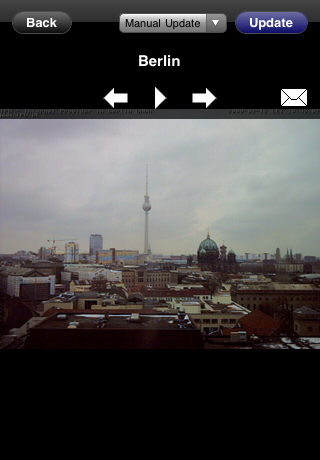 with your web cam URL and an optional TITLE as parameters (make sure it's properly encoded). Please open http://m.worldwatchr.com on the browser of your mobile phone and take your webcams with you. Hint: Send your web camera URLs by email to get them easily on the phone or store your webcam collection on our server.